The New York Athletic Club and Magerks met on June 16 at Malvern Prep in Malvern PA to decide the 2018 American Lacrosse League Championship. The NYAC got out to an early lead and was up 4-1 in the 1st quarter but Magerks goalie came up with some huge saves and their offense came back with two quick late goals to make it 4-3 after 1. Unfortunately, that is as close Magerks would get as the NYAC went on a roll in the second quarter and led 9-4 at the half. Magerks rallied to score the first two goals of the second half but were unable to stop the NYAC momentum the rest of the way. 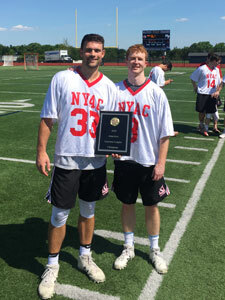 The NYAC had very balanced scoring with more than 10 players contributing points and team Co-MVP Kevin Cunningham paced the offense with 1 goal and 4 assists. Co-MVP Andrew Newbold anchored a very solid team defense who, coupled with excellent goalie play, were very stingy in giving up goals and held Magerks to 7 for the game. This is the 8th A.L.L. 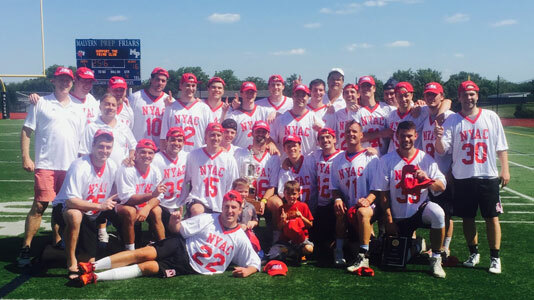 Championship for the NYAC and it's first since 2014. For information on upcoming meetings, please visit the meetings page. To get a team number from US Lacrosse - click here. To join or renew a U.S. Lacrosse membership - click here. Download the "Applicant Teams Information" file from the Documents page.